California has a new law on cell phones. 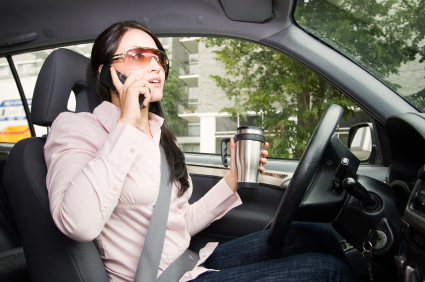 There, hand-held cell phone use was banned for drivers in July, 2008. According to data kept by the University of California, Berkeley, overall traffic deaths decreased by 22%, and hand-held driver cell-phone related deaths went down by 47%. Certainly, it can’t all be related to the law, but some of these saved lives are because of the public perception that driving while using a cell phone is just dangerous. But, California offers a big stick–in 2011, there were 460,487 Californian convictions for hand-held cell phone use. The data and the California press release are visible here. In Maryland, it is illegal to talk on a cell phone (unless it is hands-free), and to text or e-mail from a cell phone while driving. These are all primary offenses, and a police officer can give a citation to any driver who engages in this activity without evidence of other offenses. It will be interesting to track the Maryland conviction statistics, to see how aggressive our police officers are. Anecdotally, it doesn’t take long to see someone driving down the road, talking on a cell phone without the hands-free device. In our auto cases, we regularly propound discovery designed to seek out information on cell phone use by the other driver. In the appropriate cases, we will even subpoena that information directly from the cell phone carrier to prove that distracted driving was the cause of the collision. If you have been in an automobile accident, call us at 443.850.4426, or contact us online for a free consultation.